1 Today was Cinco de Mayo (the Fifth of May). Juan Valencia and his sister, Marcella, were excited. Their grandmother came all the way from Jalisco, Mexico, to see her son and her grandchildren perform in the Cinco de Mayo celebration. Juan and his sister wanted her to be proud of them. 2 Cinco de Mayo is a celebration of Mexican culture. It celebrates the victory of the Mexican Army over French invaders near the city of Puebla, Mexico. The battle took place on May 5, 1862. In both American and Mexican towns, Cinco de Mayo is celebrated with parades and fairs that include Mexican singing, dancing, feasting, entertainment and fireworks. 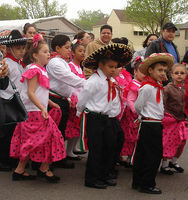 Juan, Marcella, and their father were marching in the Cinco de Mayo parade. They were also part of the afternoon entertainment on stage. 3 The Valencia family got up early that morning. Juan and his sister put on their costumes. Mr. Valencia tuned his guitar before he put it back in its case. He was in a mariachi band. Feedback on �Es El Cinco de Mayo! - It's Cinco de Mayo!